The Government-Wide Medium-Term Information and Communications Technology Harmonization Initiative (MITHI), led by the Department of Budget and Management (DBM), the Information and Communications Technology Office of the Department of Science and Technology (DOST-ICT Office), and the National Economic and Development Authority (NEDA), held the Fora on THE ICT Plan and Budget for FY 2015 at the DBM Multi-Purpose Hall, 4th Floor, Boncodin Hall, DBM Complex, Gen. Solano St., San Miguel, Manila last January 23 and 24, 2014. 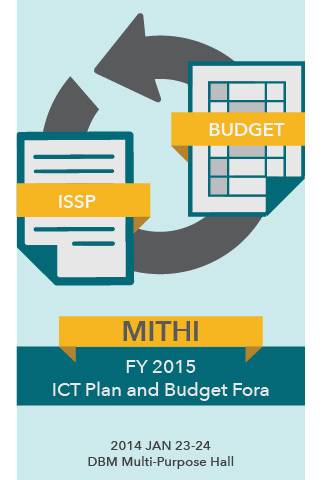 The ICT Plan and Budget Fora aim to present and clarify the guidelines on the FY 2014 Budget Execution and the FY 2015 Budget Preparation with respect to MITHI. The main points of discussion is the integration of the streamlined Information System Strategic Plan (ISSP) with Budget Preparation Document Form 201 (BP 201). These fora were attended by chief information officers (CIOs) or equivalent, information systems (IS) planners budget officers of each agency under MITHI. The presentations and the template for the streamlined ISSP will be uploaded soon. We would like to thank all the participants who showed support and active participation in this activity. We look forward to your continuous support as we continue to pursue E-Government and ICT reforms towards a more responsive and effective government of the people.